Home Parenting	The NWF Be Out There ebook is officially here! And it’s free! Remember a few weeks back when I mentioned that I would be co-authoring an ebook with The Motherhood and the National Wildlife Federation? Well, it’s finally finished and the results are amazing! I am so honored to have been included in this project, which encourages parents and kids to enjoy the last few weeks of summer and get outside. 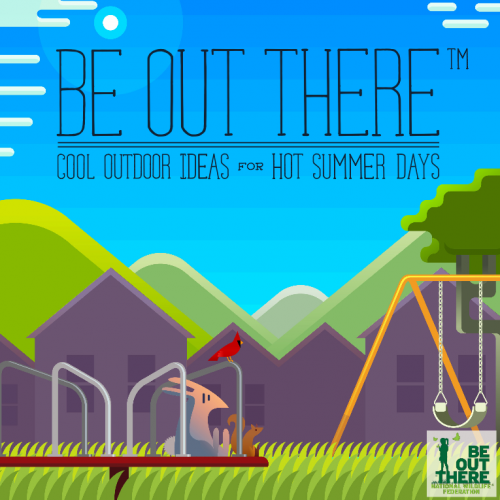 Be Out There: Cool Outdoor Ideas for Hot Summer Days is full of tips, helpful hints, and encouragement from moms who know that it can be challenging to get quality time outdoors with our kids. It’s a fun read and a great resource. Also? It’s soooo pretty! You can find the whole book here. My tips are included in the “Balancing Screen Time and Green Time” section along with more tips and advice from some really great bloggers. Make sure you flip all the way to the end so you can “meet” the authors and follow their blogs. We have a little over 2 more unstructured weeks before the boys are back in Preschool so I plan to use the tips in this book myself to help us enjoy them! Have you taken the Be Out There pledge yet? Check out this post for more ideas on getting outside with your family. How will your family spend the last days of summer together? This post is part of my compensated participation in the Be Out There ebook project. All opinions are my own! Thanks for reading and enjoy your free book! Sometimes you bow out gracefully. Other times, you just get the hell outta there as fast as you can. [WORDPRESS HASHCASH] The comment’s actual post text did not contain your blog url (https://justisafourletterword.com/the-nwf-be-outside-ebook-is-officially-here-and-its-free) and so is spam.